The Boys in Green face a crucial few days as Group D approaches its climax. Last month's disappointing results have left Ireland with an uphill task to qualify. IT’S BEEN WELL documented that qualification for the 2018 World Cup in Russia is now out of Ireland’s hands. 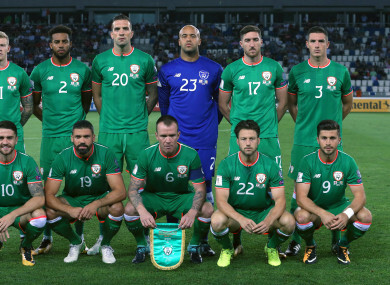 Even if Martin O’Neill’s side pick up six points in their final games against Moldova and Wales, which is an admittedly quite optimistic expectation given the team’s disappointing results and performances lately, there is a decent chance they will exit the competition as the tournament’s worst second-place team (only eight of the nine runners-up reach the play-offs). Here’s a look at the best runners-up table as it stands, with Wales — who are currently second in Ireland’s group — bottom. Keep in mind that in determining the second-place table, the results against the bottom side in all of the respective groups are discounted. So let’s assume, for the sake of this exercise, that Ireland win their final two matches. That would leave them on 19 points. However, they would be on just 13 points in the runners-up table, due to the two wins over Moldova not registering. As it stands, only Group B is assured of its second-place team reaching the play-offs. However, Ireland fans will likely see Groups H, F and E as their best hopes of qualifying for the play-offs. Keep in mind that what is needed is for a second-place team finishing on less than 13 points and therefore, below Ireland. Group H - Bosnia failing to beat either Belgium or Estonia (which would leave them on 12 points at best in the second-place table) and Greece failing to beat Cyprus (their last game is against bottom-place Gibraltar so will not count if they finish second). Group F - Slovakia losing to Scotland (the Slovaks’ final game is against bottom-place Malta so won’t count) and Scotland drawing with Slovenia, or Slovenia beating Scotland and failing to beat England (coupled with the first result mentioned). Group E - Montenegro drawing with Denmark and failing to beat Poland, plus Denmark failing to beat Romania. So how likely are they to happen? Of the aforementioned scenarios, number 3 looks the most unlikely, given that Romania are already out of contention and have nothing to play for, so Denmark will be strong favourites to beat them at home. 1 and 2 therefore are probably the scenarios Martin O’Neill’s side can look to as having the best chance of coming to fruition. Could any other favourable permutations go Ireland’s way? There are other positive scenarios from an Irish perspective too, but the above three are the easiest to explain and arguably the most likely to occur. Group A, which is led by France and followed by Sweden, is another instance where Ireland could benefit from favourable results. However, it is far more complicated owing to the fact that both first and last place is looking far from certain at this juncture, thereby multiplying the potential permutations significantly. Goal difference could also come into play, if Ireland find themselves level on points with another team in the second-place table, although the Boys in Green, currently on +1 with the Moldova result discarded, are not looking especially healthy in this regard either. Of course, even if Ireland win both their remaining games and results elsewhere work out favourably, they would still almost certainly need to qualify via the play-offs, with some strong sides likely to feature, while the potential task has been made ostensibly more difficult following recent confirmation that the draw for these games will be seeded. Are there any other alternative situations we should know about? It almost certainly won’t happen, but there is also still a very small chance of Ireland topping their group and qualifying automatically. This situation would occur if Serbia lost their final two games against Austria and Georgia and the Boys in Green got six points. Alternatively, a heavy Irish win over Moldova (a victory by four or five goals would put them in contention) and a defeat of Wales could also see them qualify automatically, if the Serbs fail to get more than a point in their climactic fixtures. Furthermore, Ireland could actually afford to slip up against Moldova if Wales do likewise in Georgia, though their final game in Cardiff is likely to be a must-win regardless. Email “6 points and one of these 3 scenarios occurring could help Ireland qualify for the 2018 World Cup”. Feedback on “6 points and one of these 3 scenarios occurring could help Ireland qualify for the 2018 World Cup”.